My, how I love a good quinoa recipe. Not only is it healthy and a much better alternative to rice or pasta, I think it’s absolutely delicious. And when combined with fresh, crunchy vegetables then dressed in a sweet and tangy ginger peanut dressing for just 4 Points per serving, well, it’s downright FABULOUS. I came across the original version of this recipe at Ambitious Kitchen, and knew I had to try it. But I made some alterations in order to make it more Weight Watchers friendly and to enhance the flavor a bit. My version uses a fantastic, low calorie peanut butter substitute called Better’n Peanut Butter. If you haven’t tried it yet, so yourself a favor and get some! It’s a LOT lower in fat than regular peanut better and the taste is pretty close. If you don’t have the Better’n Peanut Butter, or don’t want to use it, you can absolutely use regular peanut butter, though it will probably tack on an extra Point or two. 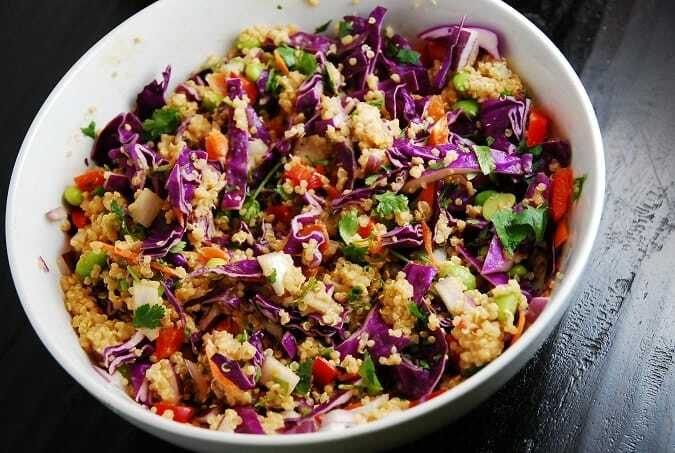 Regardless, this Crunchy Thai Quinoa Salad is a must try. This delicious Thai flavored quinoa salad is full of savory tastes and textures. The ginger peanut dressing is absolutely decadent and adds the perfect amount of zest to the quinoa and vegetables. Serve as a side or a main course. Place cooked quinoa in a large bowl and set aside to cool. Meanwhile, in a small bowl, whisk together Better’n Peanut Butter, sesame oil, lime juice, honey, vinegar, soy sauce, ginger, garlic, and salt and pepper. Once quinoa has come to room temperature, add all the vegetables. Pour dressing over top and toss to combine. Serve cold or at room temperature. Why would i ever use fake peanut butter that is mostly sugar, and add additional sugar with the honey; how disgustingly sweet is this recipe if directions are followed to the letter? Why do so many “diet or healthy” recipes add so much sugar when they take out fat? Better a half gram of extra fat than an additional 200 g of sugar. This sounds fabulous! I’ll make it this week. One question… on the nutritional info per serving, should the second protein reference (4 g) be fiber instead? :) I get 4 points+ if that is the case. Thanks! This salad made me majorly popular at a recent party. Expectations are high for the next time I need to bring a side dish! One of the most delicious recipes I’ve had. A must try. This was truly DELICIOUS! Thank you for creating it and sharing it…I’m always on the lookout for Weight Watcher-friendly vegan meals and this is a keeper! My husband and toddler adored it! I used one cup before cooking, it makes about 2 cups cooked. Seemed like the perfect ratio. Honey is not vegan but could sub agave.